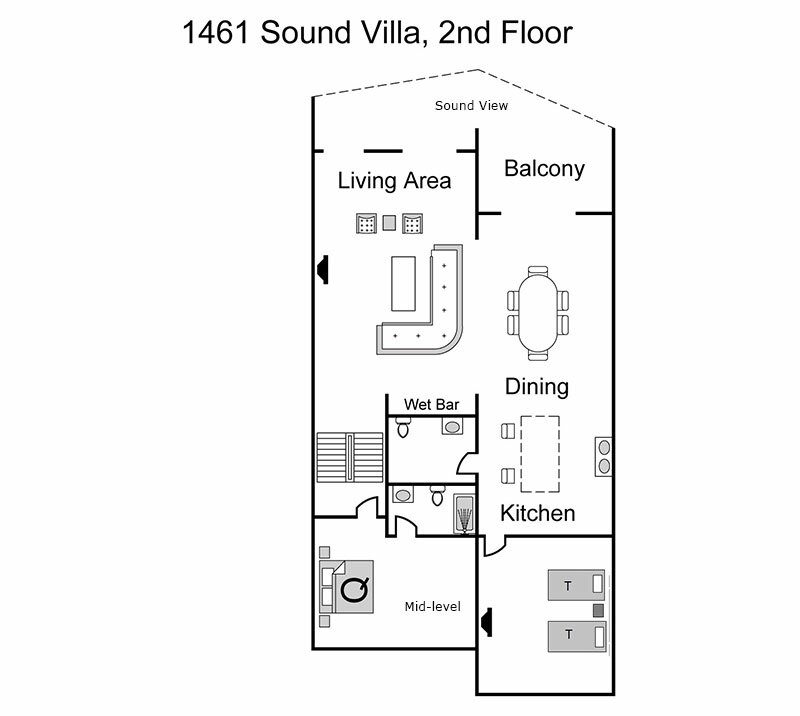 1461 Sound Villa is a stunning townhome with direct access to beach and panoramic Sound views. Three levels provide guests with 4 bedrooms, 2 living rooms, dining room and expansive kitchen, all fully upgraded with the finest appliances and materials. Elevated deck, ground-level patio with gas grill and open green space behind the unit provide the perfect setting for family gatherings and access to the beach. The main level of the home, which is the middle floor of 3 levels, features a formal living room with 55" LED TV, DVR, wet bar and drink cooler, Dining table with seating for 8 and gourmet kitchen with 2 ovens, center island with seating for 4, granite counters and stainless steel appliances. A guest bedroom with 2 twin beds (until April 2019, then will be converted to a king bed), armoire and TV is located behind the kitchen, and a half bath serves the bedroom and common areas on this level. The living room and dining room have views of the Calibogue Sound and a furnished deck on this level offers the perfect retreat for dining, reading or taking in the scenery with your favorite beverage. 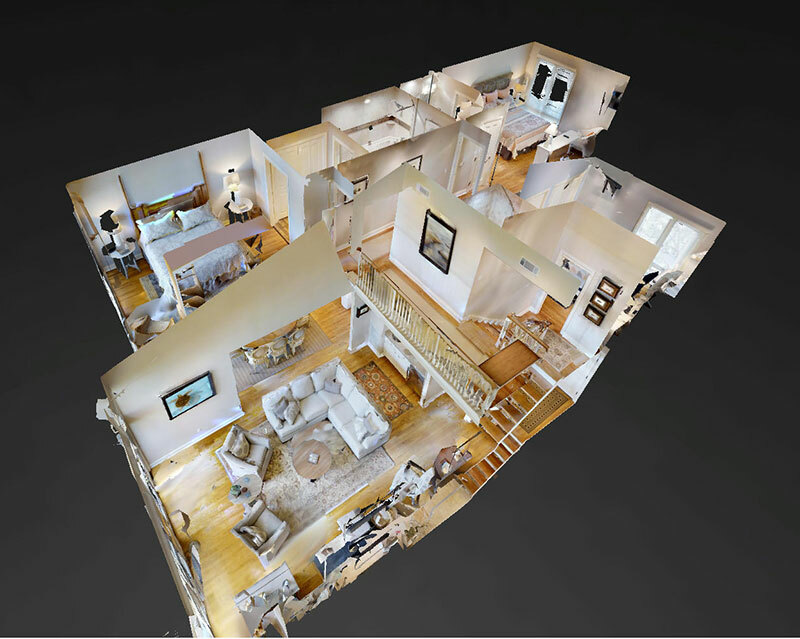 The stairs leading up from the main level reach a Guest bedroom with Queen bed, TV, closet and full bath with tub/shower combination, and the top floor of the home features the Master suite with King bed, TV, view of Calibogue Sound and full bath with separate tub and shower. 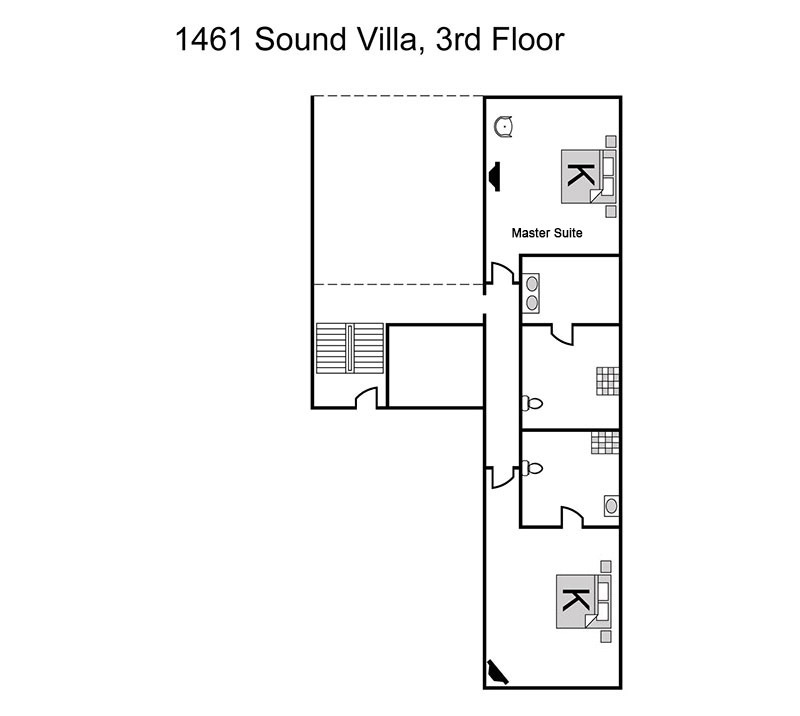 Also on the top floor is the Guest bedroom with King bed, TV and full bath with walk-in shower. High speed internet is offered for guest use and bedroom TVs include a 40" LED in the Master Suite and 32" LEDs in the other 3 bedrooms. 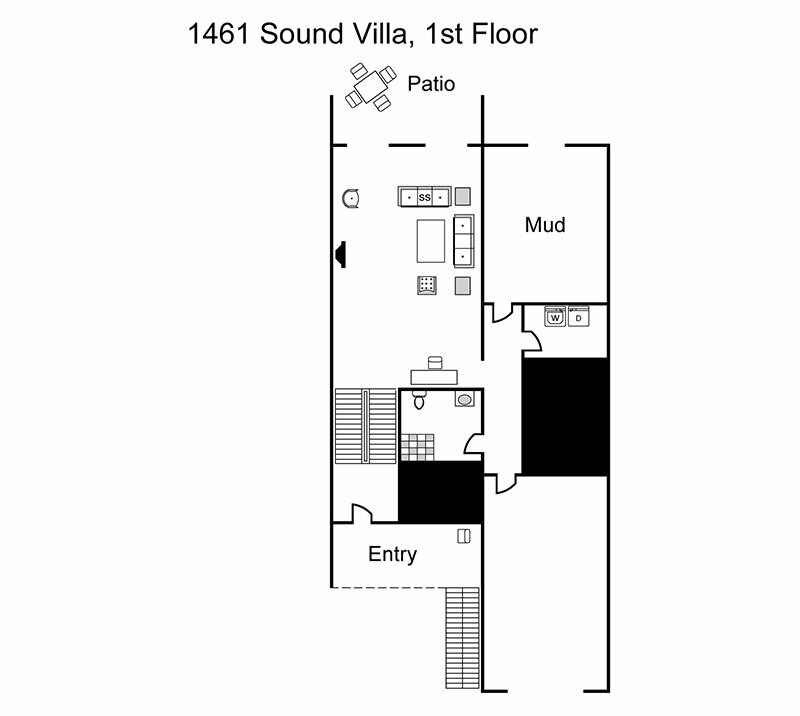 The ground level features the 2nd living room with 60" LED TV, DVR and sleeper sofa. The remote control features a “Gaming" option for guests to connect personal game consoles and a full bath is located on this level with walk-in shower. A mud room is the perfect addition to store beach supplies and accessories and the garage is available for guests to store bikes and golf clubs, if desired. The location is also just a short walk to the South Beach Marina Village shops, restaurants and activities. Private swimming pool in the complex for guests and owners of Sound Villas. Sea Pines is a world-class vacation resort with pristine beaches, miles of biking trails, Lawton Stables with live petting zoo, public golf courses, including Harbour Town Golf Links, Racquet Clubs, shopping, restaurants and fully operational marinas in Harbour Town and South Beach with water sports, fishing charters and live entertainment. Most Sea Pines amenities are open to the public, but some may have parking fees or seasonal rates as determined by the resort. We love all the room and open area. Big kitchen with everything you can think of. We usually stayed at Beachside but needed more space. Still wonderful location to ocean, Salty Dog, and tennis courts. Hope to get the same unit next year. Master bath sink might need to be looked at. Draining very slowly. Thanks. I always know that Destination Vacation will find the perfect spot with high quality units. We have never been disappointed with the service you provide. The units are clean and well equipped. It is nice to know that we can depend on you for a wonderful vacation without worry. Thank you very much. A special thank you to Gail who has helped us over the years. Having been to Hilton Head Island now at least 4 times using Destination Vacations contact was always Gail Edmonds. Everything is as expected. Keys and all info is always in the lock box. The house is always very well kept and lives up to expectations. The location, walking distance to the marina for a meal or just sitting on the desk at our place looking out at the water is always a treat. I think the amenities meet anyones standards. Always enough towels etc. The homes have everything any personal house would want. Can't say there is anything that could be improved upon. I don't think on any stay we could have found something to complain about. That's why in the last 10 years 4 of our golf vacations have been at Hilton Head. And the new clubhouse at Harbour Town is really something to be proud of. Keep up the great level of service. The accommodations were just as advertised in both the description and the pictures. The property was well kept and had an amazing well stocked kitchen with all of the possible needs for cooking and baking on site. The house was a short walk to the beach and had great views from the main living areas. We have a fantastic time. My family and I truly enjoyed our stay at Hilton Head Island. The property we stayed at was just what we expected, the home was very nice, big enough for the family and conveniently located to all the shops and restaurants. My grandkids loved that the beach was steps away and the pool.